Julia Hill, after spending 738 days in a redwood tree, has earned a degree of environmental credibility few people alive today can match. What motivates this activist, and what has she done since coming down to earth? Julia Lorraine Hill was born on February 18, 1974, in Mount Vernon, Missouri. Her father was a traveling evangelical minister, and Julia Hill and her two brothers and her mother toured the country in a 32-foot camper. She spent many days of her early childhood playing outside in the woodlands and rivers near towns where her father was preaching. When she was a young girl of six, Julia Hill and her family were hiking when a butterfly landed on her finger and stayed there for the entire hike. This event was the origin of her nickname, Butterfly. After her family settled in Arkansas, Julia Hill attended Arkansas State University, but she left to work in various bars and restaurants in and around Fayetteville. In 1996, when she was 22 years old, tragedy struck: Hill was driving a car that was smashed by a drunk driver, and the steering wheel of the vehicle penetrated her skull. "The steering wheel in my head, both figuratively and literally, steered me in a new direction in my life ... As I recovered, I realized that my whole life had been out of balance ... I had been obsessed by my career, success, and material things. The crash woke me up to the importance of the moment, and doing whatever I could to make a positive impact on the future." Some observers have noted that the accident and its effect on Hill's life bears an uncanny resemblance to an industrial accident that nearly blinded environmentalist John Muir, who changed his way of living after the incident and thereafter began to fight for wilderness preservation. After her recuperation, Hill embarked on a road trip to California that was to change her life forever. In 1997, awed by the "wisdom, energy and spirituality" of the towering redwood forests, she connected with a group of "tree sitters" in northern California who were protesting the clear-cut logging of redwoods by the Pacific Lumber Company by occupying the trees. 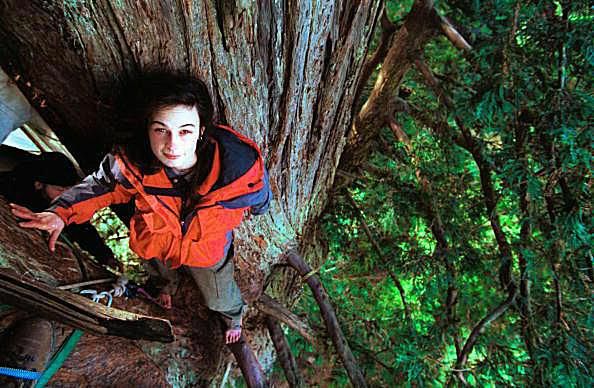 Hill agreed to join in the protest, and within a matter of days, she was 180 feet above the ground, living on a pair of six-by-six-foot platforms in a 1500-year-old redwood tree nicknamed Luna. Her first stint in Luna lasted only six days, but in December of 1997, she began a tree-sit that lasted more than two years. During her time in Luna, Hill battled illness, harassment from helicopters, freezing temperatures, a siege by security guards hired by Pacific Lumber, torrential rains and fierce winds from an El Niño winter, and other privations. She heated meals on a tiny propane stove and kept warm by staying in a sleeping bag day and night. Her courage and tenacity attracted the attention of international media, and Hill became something of an eco-celebrity. She communicated with reporters and others with a solar-powered cell phone and appeared on cable television shows as an "in-tree" correspondent. Weary of the negative publicity that Hill was attracting, in 1999 Pacific Lumber agreed to a resolution that preserved a 200-foot buffer zone around Luna and other old-growth redwood trees. Additionally, a $50,000 settlement was given to Pacific Lumber that was then donated to California's Humboldt State University for sustainable forestry research. Only then, in December of 1999, did Hill come down from Luna. Despite this victory, Luna's fate was not intact; the year after Hill came down from the redwood, Luna was vandalized with a chainsaw, which left a 32-inch-deep gash across half of the mighty tree's trunk. Only the dedicated efforts of arborists, who stabilized the tree with steel cables, saved the tree's life. Her tree-sitting with Luna was only the beginning of Julia Hill's activism. In addition to writing a bestselling book, "The Legacy of Luna," Hill also penned an environmental handbook, "One Makes the Difference." Hill also co-founded the Circle of Life Foundation, which has morphed into the Engage Network, a non-profit social activism group. "The tree-sit and action since created this very particular role that Julia Butterfly Hill fulfills ... at the same time, I'm looking for what's next for me, and it's so easy to stay in that role that myself and this world co-created together. But I just know that there's aspects of it that need to shed." She offers life coaching via her website and posts video blogs.